Rumors have been circling for a while, but a new description of the Nintendo Switch on retailer GameStop’s website suggests that a Pokémon game will be coming to the Nintendo Switch console. Interestingly, this section of the listing has now been removed. Whether that means it was an accidental leak or fixing the mistake of an overzealous copywriter is unclear. Since the days of Red and Blue, Pokémon has been a handheld-first franchise. Though we got the chance to play titles such as Pokémon Stadium on the big screen, Game Freak never took the mainline games down this route. However, now that Nintendo is releasing the hybrid Switch console it seems inevitable that a mainline Pokémon title will be having its first home console release, given that it's one of Nintendo’s most successful franchises. In fact, it would perhaps be more surprising if Nintendo didn’t release a Pokémon game on the console considering its popularity. The idea of a Pokémon game coming to the Nintendo Switch was first floated around in November after Eurogamer reported that multiple sources were claiming the Switch game had been developed alongside Sun and Moon. 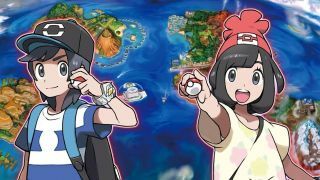 It’s suspected that the game will be a director’s cut of Sun and Moon titled Pokémon Stars. Nintendo hasn’t commented on the rumors, but we might not have to wait long to find out since Nintendo’s big Switch event on January 12 is fast approaching. In a Treehouse Livestream following the main press conference, Nintendo has said we’ll get the chance to see more about the games that will be available on the Switch console, one of which could very well be this mysterious Pokémon game.